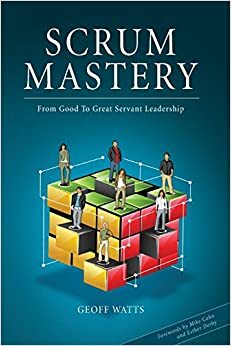 In Scrum Mastery, from Good to Great Servant Leadership, Geoff Watts shares stories and insights on what it means to truly embrace the principles of servant leadership and help your team to perform at their highest level possible. This book is a must-read for all Scrum Masters who want to contribute more to their teams than a “smoothly running Scrum process” and some impediment removal. A good Scrum Master will be indispensable to a team. A great Scrum Master will become both dispensable and wanted. What does it take for me to be great? What makes a great Scrum Master? Is there a book on that subject? [Great servant leaders] are highly ambitious, but not for themselves; instead they want their organizations to excel. They build successors rather than try to set people up to fail to make themselves look good. A good Scrum Master is wary of influencing the team. A great Scrum Master can act normally and knows that the team will still make their own decisions. I referred to this quote in my 2015 Scrum Master evaluation with respect to helping the team with technical practices; it really struck a chord with me. I’m thinking of writing a page on my journey to great Scrum Mastery; for instance by taking the good-great comparisons in this book and the Characteristics of a Great Scrum Master post by Barry Overeem and collecting evidence of my good and great Scrum Mastery. I’ll let this sink in a bit, will be continued.